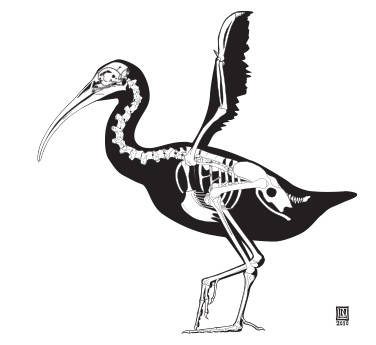 When researchers first unearthed the bones of the extinct ibis Xenicibis xympithecus, they thought the fossils came from a seriously diseased individual. The wing bones were deformed in a way no one had ever seen before. But as more of the ancient bird's bones turned up, scientists were forced to conclude that the weird deformity was actually serving a purpose. Last week, Nicholas Longrich and Storrs Olson reported that this ancient, flightless bird, as far as they can tell, used its clublike wing for whacking other animals. The bone at the far end of the wing is large, heavy and curved. The long upper-arm bone would have allowed for a good swing, like a baseball bat. Although the bird looks pretty menacing, it was only about the size of a chicken. The scientists speculate that Xenicibis may have used its wing-fists to fight other members of its species, or to defend its eggs or young from predators. Though no other bird, living or extinct, has a wing like this, steamer ducks do have modified wings that they whomp each other with. They often fracture their bones in these fights, so the researchers looked for signs of fractures in Xenicibis. Sure enough, there were healed fractures in some of the fossilized wing bones. What's unusual about this bird is that it became flightless even though there were predators living around it. The ibis might have had a trick up its sleeve (so to speak) to protect its young, and the whacking wing would have been a good start. 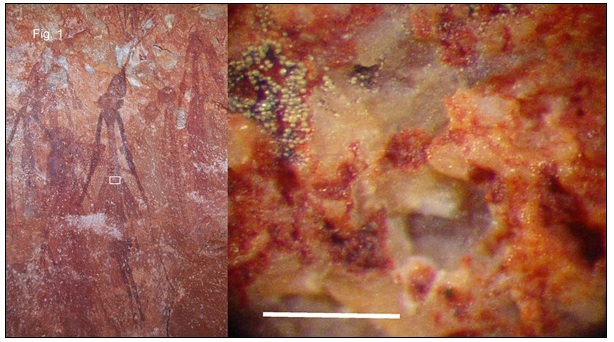 In other news of prehistoric relics that aren't what they seem, researchers have discovered that some Australian rock paintings actually contain no paint. Studying the Bradshaw rock art, a group of paintings 46,000 to 70,000 years old, the researchers noticed that the artwork was covered in a film of fungi and bacteria. On further inspection, it turned out that all the original paint was gone. Lead researcher Jack Pettigrew says these colonies of microorganisms explain how the Bradshaw paintings have managed to resist fading, in spite of millennia of exposure to rain and sun. The bacteria and fungi appear to have been feeding on each other for countless generations, staying within the outlines of the paintings. The first organisms to colonize the paintings must have eaten the paint itself. This "living pigment," as the authors call it, comes in various shades of red, brown, and black, depending which species are dominant in that patch of art. Though the bacteria and fungi have destroyed the artwork's original colors, they created new, vivid paintings with an indefinite lifespan.